Nassau, Bahamas - POLICE have launched an intensive manhunt for the male responsible for the fatal shooting of a Police Inspector, Wednesday, 12th September, 2018. Reports are that around 3:00pm, the Inspector, who has been identified as Carlis Blatch, was sitting in a vehicle along with his daughter, in the vicinity of a Junior High School, in the western district of New Providence, when he was approached by a male armed with a firearm, who ordered him out of his vehicle. As the officer was exiting the vehicle, the gunman shot him, got into the vehicle and drove away. Inspector Blatch was transported to Hospital by Paramedics and later pronounced dead. His daughter was able to escape from the vehicle unharmed. A short time later, the Officer’s vehicle was recovered on Trelawny Garden off Farrington Road. Police are appealing to members of the public, especially persons in the Farrington Road area who may have seen a male coming from a blue Hyundai Elantra or who may have information concerning this incident, to contact the Central Detective Unit at 502-9991/2, 911/919, crime stoppers at 328-TIPS (8477) or the nearest police station. Shortly before 1:00am, Thursday, 13th September, 2018 Southern Division Officers were on patrols on Curtis Road, Bain Town when they saw a male standing on the side of the street. Upon seeing the officers, the make began acting in a suspicious manner and began to run. Officers gave chase and saw when he pulled a firearm from his clothes and threw it into nearby bushes. 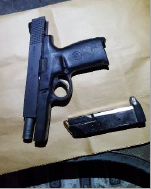 Officers caught the male, conducted a search of the bushes and recovered a .40 pistol with 11 rounds of ammunition. The male is expected to be formally charged before the Magistrate Court later this week. Police on the island of New Providence are investigating an armed robbery which occurred Wednesday, 12th September, 2018. According to reports, shortly after 11:00pm, a female was sitting in a vehicle at Arawak Cay, when she was approached by a man armed with a firearm, who robbed her of her handbag containing cash and other items, before getting into her burgundy Nissan Note and driving away.